Here’s the skinny on the build process. I started with a vector that I drew up in Inkscape from in-game screen shots. 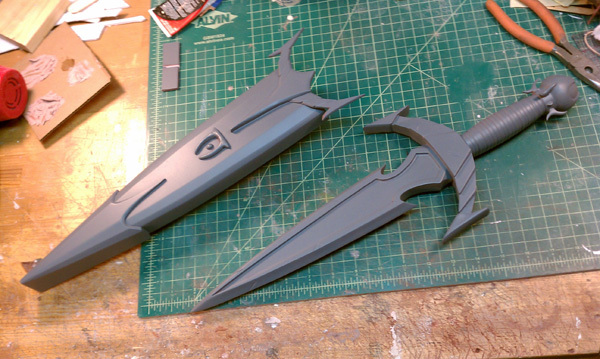 The basic shape of the blade and hilt were cut from layers of foam PVC. 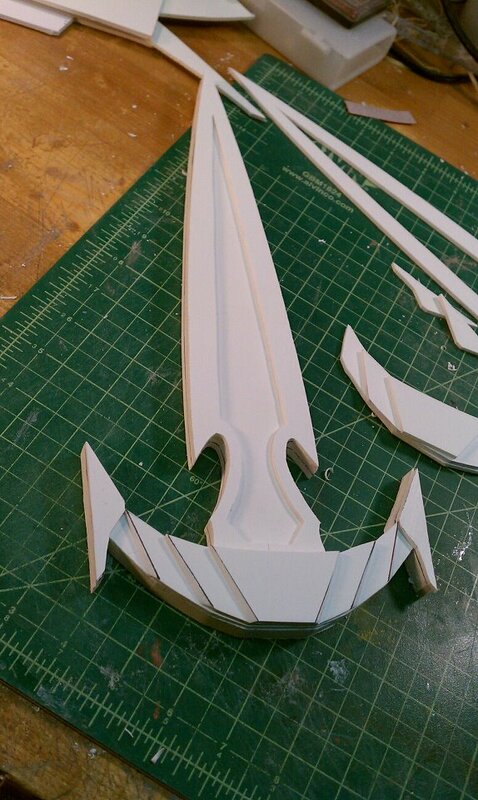 The middle layer is 3/8″ thick and the inlay part of the blade/hilt detail were cut from 1/8″ thick foam PVC. 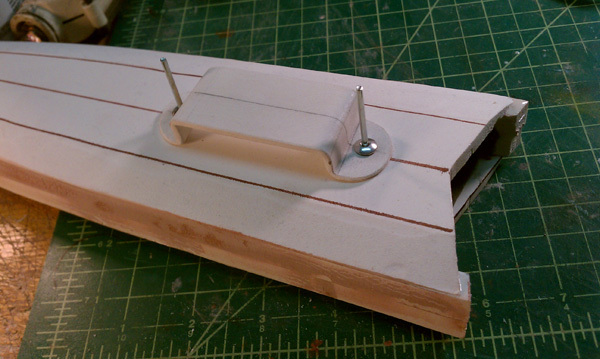 The layers of foam PVC were all glued together with epoxy. The flush edges were sanded down smooth. The edge of the blade curves in a bit, so I sanded it out with a drum sander on my Dremel. I got a chance to use my new lathe for the handle of the dagger. I poured some plastic resin in a toilet paper roll to get a cylinder of plastic and then turned that on my lathe. 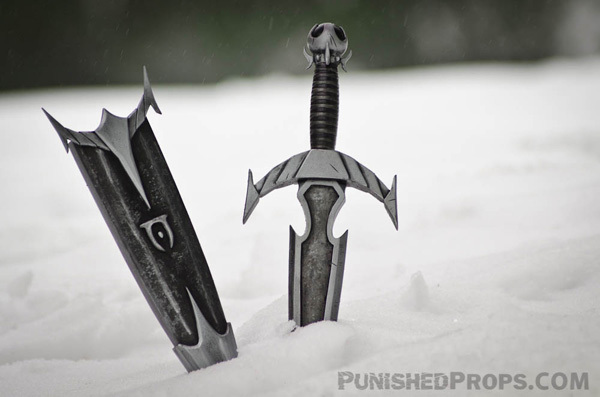 The orb pommel was made from an acrylic sphere and was epoxied to a threaded rod that was used to attach all of the parts of the dagger. 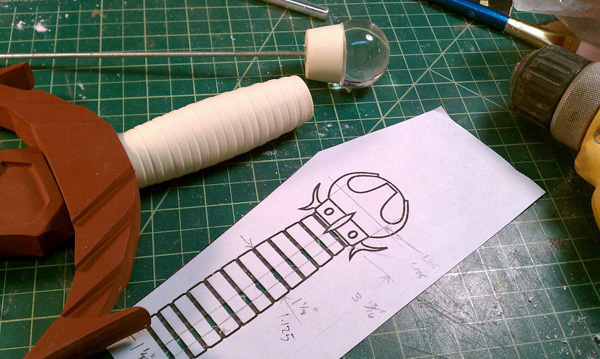 I don’t have many progress photos of the scabbard, but you can get a decent idea of what I did here. It’s layers of plastic again and I glued cloth on the interior to protect the blade of the dagger. I curved a piece of foam PVC for the belt loop and riveted it to the scabbard. I don’t have progress photos, but the gem and tiny hook thing details on the pommel were made by hand from small pieces of PVC and attached to the pommel with bits of wire for support. 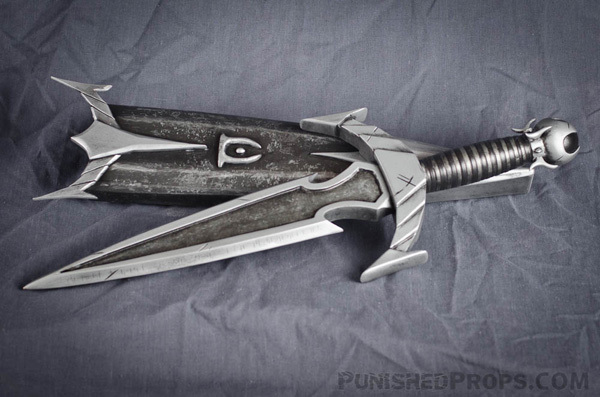 The Oblivion symbol on the scabbard was made by shaping some Magic Sculpt. Then the whole thing was sanded and primed! 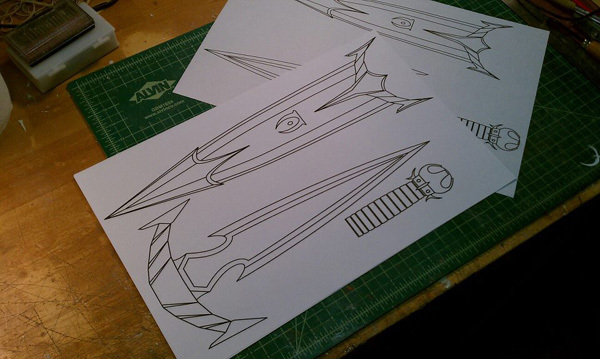 Side note: I also made a mold of the dagger so that I can make more copies. 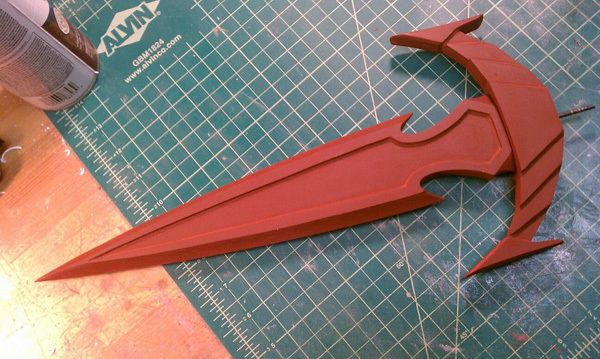 I’ve been enjoying my airbrush and used it for all of the flat colors on the dagger. The rest of the detail was painted by hand. Here is the finished, painted piece! If you like it, do me a favor and like my facebook page and/or follow me on twitter. I usually post progress photos ever day that I’m working on a prop!